Scientists expressing concern about anthropogenic global warming always seem to ignore paleontological evidence. There is no better example of their alarmist approach than the oft-stated fear that global warming might cause the extinction of arctic marine mammals. Yet, during the Sangamonian Interglacial (~132,000-~118,000 BP) the north polar ice cap completely melted, and there are no known extinctions of arctic marine mammals when this occurred. Pleistocene ranges of seals and walruses were greatly expanded compared to the extent of where they live now. And during both cold and warm climate cycles marine mammals occurred much farther south than they do today. It’s more likely that their ranges are more limited today due to anthropogenic overhunting rather than changes in climate. Evidence of my above-stated observation comes from fossils of seals and walruses found off the coast of South Carolina. 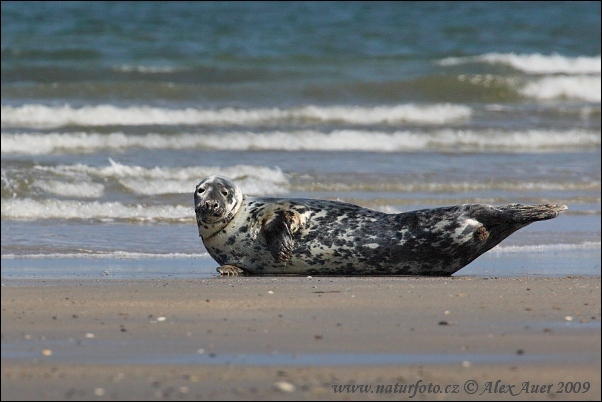 Photo of gray seal from google images. This species occurred at least as far south as South Carolina during the Pleistocene. Now that they’re protected, it’s believed their range will expand farther south than New Jersey once again. 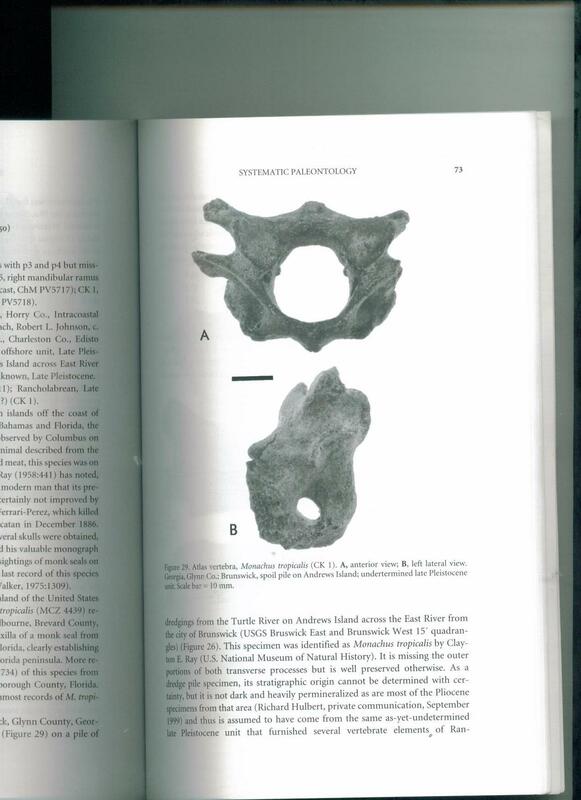 Fossils of this species have been found on Edisto Beach, South Carolina. Until the Marine Mammal Protection Act of 1972, bounties kept the population of gray seals low, reducing them to 2,000 individuals on the North American side of the north Atlantic. Since then, the population has expanded south to New Jersey where they frequently resort during winter. They’re expected to spread even further south and may some day recolonize South Carolina. They eat fish, lobster, and octopus. Hooded seal from a picture at google images. Man are they ugly. The balloon on the males’ nose is used to attract mates. Hooded seal flipper bone fossil found off the South Carolina coast. All the pictures of fossils in this blog entry are from Additions to the Pleistocene Mammal Fossils of South Carolina, North Carolina, and Georgia by Albert Sanders. 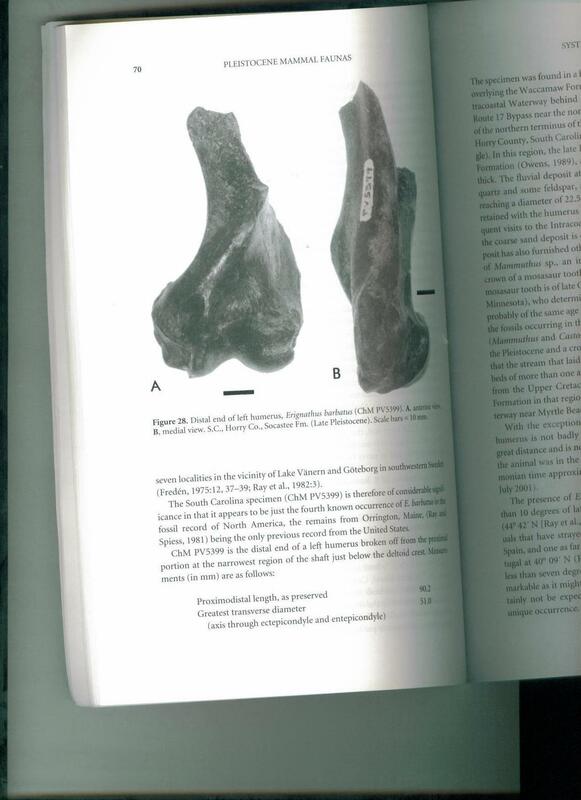 The above fossil flipper bone was recovered in Horry County, South Carolina and is believed to be Sangamonian in age. This solitary species mostly occurs in the arctic but is known to wander widely and has been reported in modern times as far south as the Carribbean. Perhaps this specimen belonged to one such straggler. Photo of a walrus from google images. Fragments of walrus tusk fossils discovered off the coast of South Carolina. At least 6 fragments of fossil walrus tusks have been recovered from sites near Charleston, South Carolina, proving this species lived in the southeast long ago. Moreover, one amateur fossil collector reports finding a walrus fossil in Florida. Other walrus fossils turned up in North Carolina and Virginia, so at one time they must have been frequent visitors to southern beaches. Most of the walrus fossils are assumed to be from a warm interglacial age because they’re found near the present day coast. During glacial times, the Atlantic coast was many miles to the east of the present day coast due to the drop in sea level during the Ice Age. I have no doubt walruses are solely limited to arctic regions today because of the remote geography where they’re difficult for human hunters to access. Walruses mostly eat marine worms and molluscs which they find on the ocean floor with their whiskers. Male walruses occasionally kill or scavenge and eat seals. This behavior is probably related to high testosterone levels, much like male elephants that go on a rampage when they’re in the mood to mate. It’s sad to think that this is the only evidence left of a species once frequenting Georgia’s coast. It’s a vertebrate of a monk seal. Man hunted this warm climate seal into extinction by 1952. It’s last reported sighting was off the coast of Jamaica. It was last reported off the coast of Texas in the 1930’s. One fossil collector found bones of a monk seal on Andrews Island near Brunswick, Georgia, and others have found them at many sites off the coast of South Carolina. What a shame the species couldn’t make it to 1972 when the Marine Mammal Protection Act passed. Ladds Mountain, located in northwestern Georgia, is perhaps one of the best Pleistocene fossil sites in the state and yields the most mammalian species of any, though not many are of the famous large species. Many caves and fissures pockmarked the mountain. During their existence, these caves afforded dens for the animal life of the time, but eventually they collapsed and eroded. Fortunately for fascinated scientists, the calcareous flowstone mixed with red clay to preserve the fossils. I took this photo of Ladds Mountain, Bartow County, Georgia. A fence prevents honest people like me from trespassing to hunt for fossils. The numerous fossils of small species found here provides intriguing clues about the paleoenvironmental conditions at the time they lived. One of the interesting small species was the giant or noblest chipmunk (Tamis aristus). Its anatomical characteristics were exactly the same as those of the living eastern chipmunk (Tamias straiatus) with the exception of a notable size difference–the extinct species was 10%-30% larger. 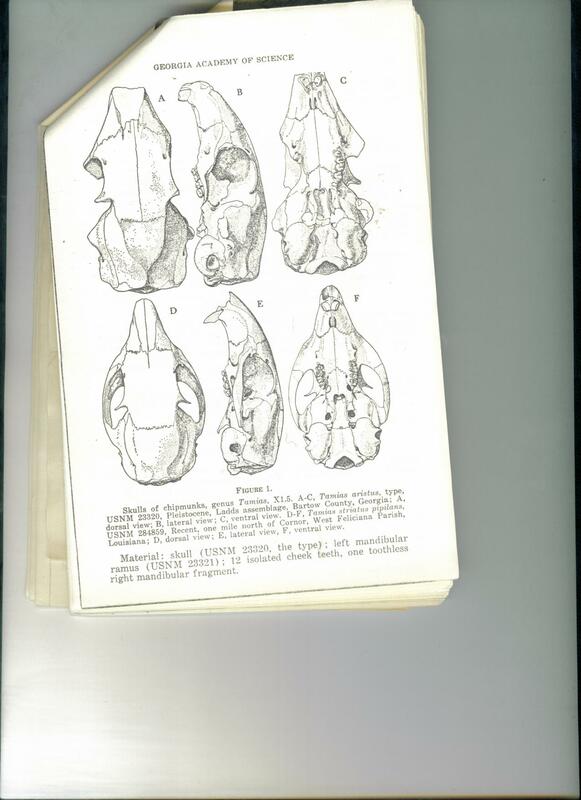 Skull comparison between the two species of chipmunks from a paper written by Clayton Ray. Tamias aristus was larger but otherwise they’re similar. I also notice a suture on top of the skull of the larger species that doesn’t appear on the specimen of the smaller species. Photo of an eastern chipmunk from google images. I chose this one because it shows the species in its favored habitat–in a rocky woodlot. Chipmunks store food in cheek pouches and carry it to tunnels under boulders and tree roots where they hoard the food. They become dormant during bad weather. I believe this is why they survived the Ice Age while its larger cousin did not. During the last interglacial it co-existed with its larger cousin. Clayton Ray first studied the fossil remains of the giant chipmunk in the 1960’s. He tentatively decided that it was a distinct extinct species, though he believed it may have merely been a larger subspecies of the still extant eastern chipmunk. Today, the eastern chipmunk reaches its southernmost range limit in central Georgia. They live around Atlanta and Athens but are absent in Augusta. 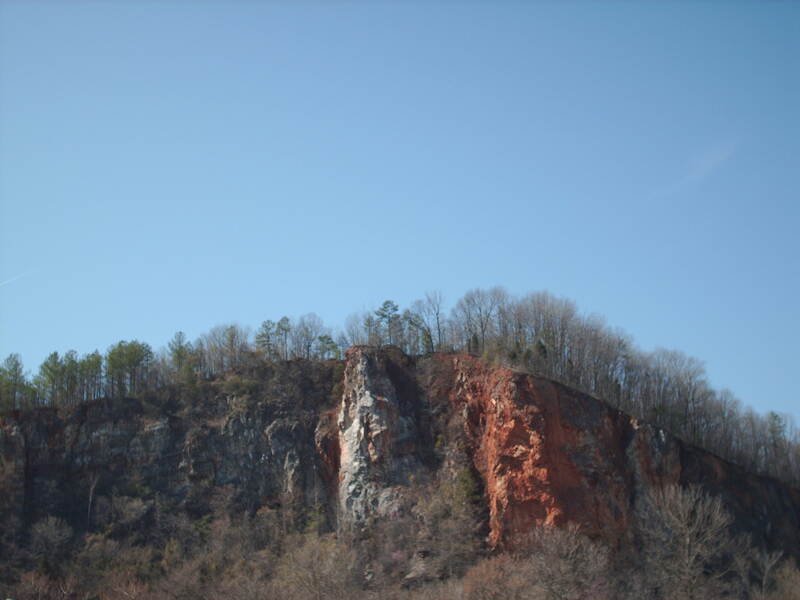 There are more rocky boulders and crevices in the piedmont than there are in the coastal plain. Chipmunks like to tunnel and den in and around big rocks. The coastal plain is also a tad warmer, allowing chipmunk-eating snakes to be active for a longer time period of the year. I consider these two factors to be the reasons chipmunk ranges are limited in the south to the piedmont and mountain regions. Tamias aristus is not common in the fossil record, though that doesn’t necessarily mean it wasn’t successful and abundant for a time. 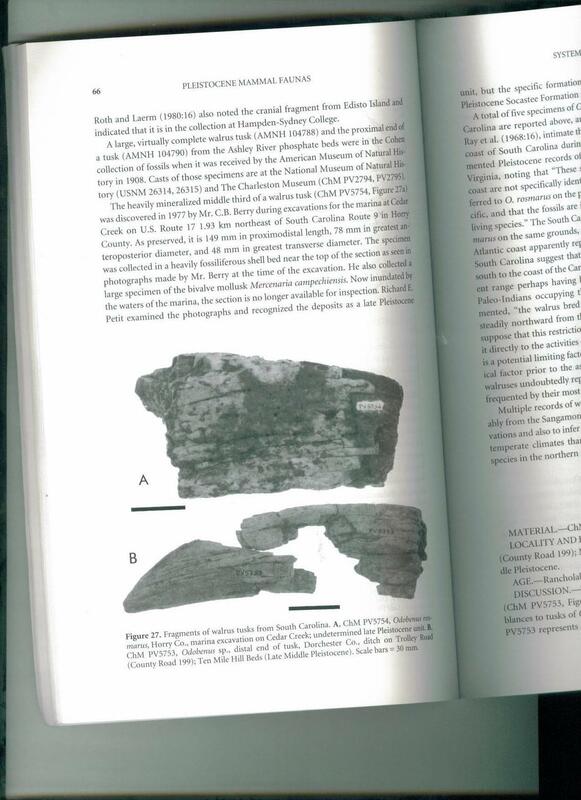 Fossil specimens have only been recovered from one site other than Ladds–Arredondo IIA, located in north central Florida. Fossils from Arredondo IIA are thought to be Sangamonian in age. The Sangamonian was a warm interglacial period lasting from ~132,000-~118,000 years BP. No good radiometric dates from any of the fossils found at Ladds have ever been recorded, indicating the fossils were too old for carbon dating (carbon dating isn’t possible for fossils older than 50,000 years). As far as I know uranium series dating and pottasium-argon dating have never been attempted or aren’t possible here. However, fossil specimens of the extinct giant tortoise (Hesperotestudo crassicutata) and the Florida red-bellied turtle (which today only occurs in Florida) were recovered from Ladds–evidence that the fossils accumulated here during a period of time when the climate was much warmer than that of today. This also fits Ladds in with a Sangamonian interglacial age along with Arredondo IIA. Conversely, a few species found at the site indicate cooler climate as well, but it’s not a convincing list–none are definitively dependent on a cooler climate–and it’s unclear whether fossils of different ages are mixed here. The late Dr. Alan Holman, North America’s foremost authority on Pleistocene reptiles and amphibians, studied the cold blooded vertebrates found at Ladds, and he determined the all lived here during the same phase of climate. In my opinion based on the preponderance of temperate and warm weather species, the Ladds fauna is probably from a full blown interglacial period. Dr. Alroy tackled the problem of determining the age of fossil sites hampered by the lack of quality radiometric dating. Using the known ages of species appearances and disappearances in the fossil record as a kind of index, he estimates the ages of sites. He calls this “appearance event ordination” or AEO. This method is necessarily a very rough and inexact estimate. Nevertheless, he estimated the age of the fossils found at Ladds to be about 300,000 years old. One of the species he uses as an index for Ladds is the Vero tapir. He placed the Vero tapir as existing until 300,000 years BP, but I believe he made a mistake. Bjorn Kurten considered the Vero tapir to be the common southeastern species of tapir until the megafauna extinction of ~12,500 years BP. Moving the disappearance date of the Vero tapir changes the estimated date of Ladds fossils. I have no way of knowing for sure, of course, but because the species of fossils here are so similar to those at Arredondo IIA, I suspect it’s also Sangamonian in age. I’m more certain that the animals here did live during an interglacial of some kind, if not the Sangamonian, than the Yarmouthian (~200,000 BP) or the Aftonian (~300,000). Tamias aristus apparently co-existed with Tamias striatus because the fossils of both are found at Ladds. They obviously share a common ancestry, probably evolving from the same species. I hypothesize that their ancestor evolved along two lines: the larger species grew bigger because it foraged year round, while the smaller species became dormant during bad weather. Both species did well in the rich oak and chestnut forests of the interglacial age and perhaps well into the early Wisconsinian Age when the climate was still mild. But as the climate became drier and cooler, grassland replaced forests. The remaining forested areas provided limited habitat, and the smaller chipmunk adapted better. I believe the smaller chipmunk had a survival advantage because it became dormant during the bad weather of the Ice Age. The larger chipmunk could function year round–an advantage in a warm climate. But it lost that advantage during the Ice Age and instead became victim more frequently to hungry predators in winter, while its smaller cousin stayed hidden and safe during times of the year when food became scarce for carnivores. Here’s the list of mammalian species found at Ladds and Arredondo IIA. Notice the striking similarities. Note: there were other species living near these sites that never perchance left fossil evidence at either one. * denotes species found at both sites. X denotes extinct species. *X dire wolf (probably)–Based on one tooth, Clayton Ray considered it to compare favorably to the gray wolf. Dr. Nowak, the foremost authority on Pleistocene canids, later looked at this tooth, and wrote that it did fall within the size range of dire wolf. Because Ladds probably dates to the Sangamonian interglacial, it must belong to a dire wolf because gray wolves didn’t colonize North America yet. X river cat–Scientists are unsure whether this was a distinct extinct species, a margay, or a jaguarundi. The paleodatabase lists 15 amphibians but just one reptile as being recovered here. I think this is incomplete. I believe more reptiles than that were found here but just haven’t been listed on that source. 42 species of birds, including 3 extinct kinds were found here, but again, they’re not listed on the paleodatabase. The predominant environment at both sites during the Sangamonian interglacial was probably a rich oak and chestnut hardwood forest interspersed with small prairies and dotted with swamps and marshes. I tried very hard to write a perfect book with no factual mistakes, typos, or bad grammar. I’m not a scientist nor a well known writer. Moreover, my book is self-published. So I was doubly motivated to produce a flawless product. I could’ve paid a professional editor to go over my book, but they cost at least $500–more money than I actually expect to make from publishing this book. And even after paying such a fee, the book could still have mistakes because editors are not Gods. (As a self-published author, it always delights me to find typos and misspellings in books produced by big book publishers. I know that’s a shameful attitude.) Anyway, I didn’t write the book, and I don’t write this blog for money–I write about this subject matter because I love it. The link below is for my book on amazon. I was hoping a photo of my book would appear when I cut and pasted the link. Most of my book sales have been from amazon.com. I only make $1.31 when my book sells on amazon. Amazon and Lulu publishers get the rest. I make a very small piece of the pie. Incidentally, you can get the book cheaper directly from me. I charge $24 which includes shipping for a signed copy. You can get an electronic copy of the book from lulu.com for just $3. Since I published my book, I’ve become aware of 3 errors in it. I’m sure there are more. Readers, please let me know of any. Just write a response to this blog entry, and I’ll note it. The first error is my portrayal of Panthera atrox, formerly Panthera leo atrox, as an animal behaving exactly like an African lion in my chapter recounting an imaginary journey through what’s now Augusta, Georgia 20,000 BP. Approximately the same time I wrote my book, a scientist was thoroughly studying the anatomy of this species, and he determined it was not a lion, but rather an extinct distinct species within the Panthera genus. It was a kind of giant panther with a skull like a lion but with a jaw like a jaguar. I discuss this paper in a July blog entry entitled “Panthera atrox. What kind of cat was it?” I was unaware of this study at the time I wrote my book. Given this new information, I believe it unlikely this giant extinct panther was a social cat, though I’m certain it did battle packs of dire wolves over prey. I imagine it was less successful in conflicts with dire wolves than a pride of lions would’ve been. The third error is the only one that embarrasses me. In my section on cougars (Puma concolor) I mistakenly wrote that Charlie Killmaster is the hunter who killed a cougar in Georgia in 2008. Actually, the name of the hunter from my source is never given. Charlie Killmaster was the Department of Natural Resources employee who documented the event. The reason this mistake embarrasses me is because I sent a free copy of my book to Rob Pavey, the outdoor editor of the Augusta Chronicle. He wrote the article I used as my source. Oh well, I flubbed that one. I have one more comment. I posted a few excerpts from my book on one of my favorite websites–the Fossil Forum. An unfavorable critic there suggested that I shouldn’t give up my day job. This reveals a misleading belief some people have of the writing profession. For every John Grisham or Stephen King, there are hundreds, if not thousands of published writers, who can’t afford to give up their day jobs. Most published writers are English professors or journalists who must continue to work their day jobs, even after they publish their book in order to put food on the table. ($1.31 doesn’t go far these days, even if multiplied by a 100.) We don’t write for money; we write because we love the subject we’re writing about. For next week’s blog entry I hope to write about the extinct giant chipmunk–Tamias aristus. And I’ll have a complete list of species discovered from the Ladds fossil site and Arredondo IIA. Map of ancient Lake Agassiz. A glacier ice dam formed this lake which existed from ~13,500-~8200 BP. As the map shows, Lake Agassiz was bigger than all the Great Lakes combined and at the time of its existence was the largest freshwater lake in the world by far. About 12,900 years ago a major breach of the ice dam that formed this lake occurred, flooding the North Atlantic with cold freshwater and shutting down thermohaline circulation (as I described in last week’s blog entry). This event (known as a Heinrich event) triggered a sudden cold snap referred to as the Younger Dryas, named after a species of flower that flourished in Europe during this arid cold phase of climate. The Younger Dryas lasted for 500 years as earth’s temperatures in the northern hemisphere plummetted back to levels equal those of the last glacial maximum (~29,000-~15,000 BP). As the climate cooled another ice dam formed stopping the outflow of water, so that Lake Agassiz continued to exist. But climate gradually warmed again and the final dissolution of the lake occurred about 8200 BP. Map showing final outflow of Lake Agassiz. After glacier ice dams broke, the water escaped through tributaries leading to the St. Lawrence River, the Mississippi River, Hudson Bay, and western rivers as well. The final dissolution of Lake Agassiz also shut down thermohaline circulation, causing a shift in climate to arid and cold, though it wasn’t nearly as severe as the Younger Dryas. Nevertheless, this time, the dissolution of Lake Agassiz was complete, and scientists believe sea levels rose by as much as 1 meter in less than a year. It occurred to me that this closely correlates with the period of time when the Okefenokee basin filled with water and became a swamp. Scientists carbon dating the peat there discovered that the modern version of the Okefenokee became swamp about 7,000 years ago. This is also roughly the time of modern barrier island formation off the Atlantic coast. Between ~36,000 and ~7,000 years BP, the Okefenokee basin consisted of open pine savannah and scrub oak interspersed with small scale streams and freshwater marshes, but an increase in atmospheric moisture and the rise of the water table led to swamp development. It’s likely that swamps periodically developed in the basin and periodically dried out following fluctuations in the water table throughout the Pleistocene. It’s also been noted that the final dissolution of Lake Agassiz and other glacial lakes all over the world may correlate with worldwide flood myths. The final dissolution of Lake Agassiz caused sea level to rise by 1 meter in just 1 year. This would have flooded coastal regions. The literal story of Noah’s flood is impossible, but it may be based on some truth. A flood that covered the entire world is geologically impossible, and there is no scientific evidence to support this belief. But it is likely that the dissolution of Lake Agassiz and glacial lakes in Europe did cause major localized flooding in many areas of the world on a scale far surpassing anything from recent recorded history. One clue regarding changes in climate patterns resulting from this event comes from Genesis 7:12 in the bible. “It rained for 40 days and 40 nights.” The Little Ice Age, a relatively minor climatic event but one that had a major impact on European agriculture for 500 years (1314-1850 AD) began with cold rainy summers–lots and lots of rain. It’s plausible that the initial flood of freshwater into the North Atlantic caused a low pressure system that drew unusually prolonged spells of cold rain in summer, though, of course, not exactly 40 days in a row. But it wasn’t rain that caused the flooding. 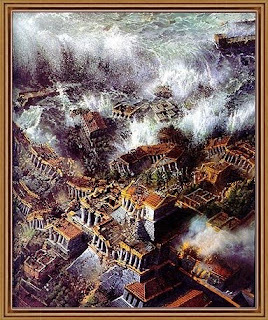 Instead, it was the sudden rise in sea level that destroyed coastal villages. Whether or not the villages were morally wicked was coincidental. Today, Lake Winnipeg and a few other Canadien lakes are remnants of Lake Agassiz. The Great Lakes formed from melted glaciers in ancient river valleys scoured out by glaciers. The Great Lakes formed and reformed many times throughout the Pleistocene, and it’s probable a glacial lake has repeatedly re-occurred on the site of Lake Agassiz as well. You are currently browsing the GeorgiaBeforePeople blog archives for January, 2011.